Constant Contact can be found at the top of countless lists analyzing the best email automation platforms. Integrating this automated email service into Rank Ranger lets you compare each of your email campaigns across multiple metrics inside the Compare Email Campaign Performance report. With this data appearing inside a table that can be sorted by any of the metrics in either ascending or descending order, you can easily execute a campaign analysis from multiple perspectives. The data you choose to show within the above shown table is entirely up to you. That is, you can select which email campaigns you wish to have shown within the report's table. Some of you Rank Ranger faithfuls might be scratching your heads, since we integrated MailChimp into Rank Ranger a few months ago. Quite right, but as we mentioned, we were intent on offering a few options via multiple platforms from the get-go. So after making MailChimp the email platform integration guinea pig, we introduced Constant Contact and AWeber to Rank Ranger as well. With that, we thought it would make sense to show you what you can do with your MailChimp integration alongside that of the other two email platforms (as shown above). 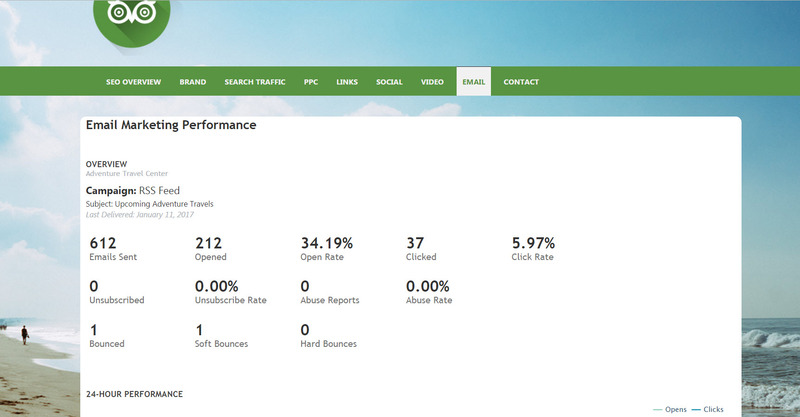 With that little introduction, the MailChimp Campaign Performance Overview report is broken into four data-filled sections. 2) 24-Hour Performance Graph: Like it sounds, the 24-Hour Performance Graph gives you an hour-by-hour visual snapshot of your opens and clicks for the last email you sent, covering the first 24 hours of its release. 3) Top Links Clicked: This MailChimp report element provides you with live links, along with the number of clicks each link received, for the top links within the last email you sent out. 4) Locations by Opens Map: Here you are presented with an interactive map that offers deep data insights in relation to the last email sent with the service. Via the map, and its hover ability, you can determine which locations throughout the world have garnered you the most clicks down to the exact number (via the hover function). In typical Rank Ranger fashion, we wanted to provide you with a set of advanced and custom email campaign reporting capabilities. It's this sort of thinking that resulted in you being able to create custom email marketing graphs (AWeber only) as well as showing your email performance within white label reports. 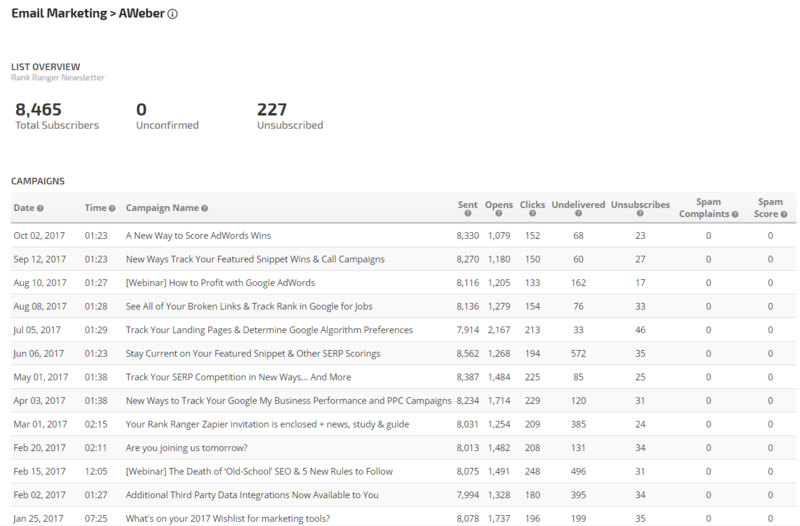 We love the Insight Graph, and by adding AWeber email campaign data to it we love it that much more. With the versatility of the Insight Graph you can do things like compare multiple email marketing metrics over a prolonged period of time. Of course, you could also compare your email campaign success to any other dataset available in the graph, such as rank, Analytics, Google Search Console, Bing Webmasters Tools, AdWords, Bing Ads, CallTrackingMetrics, CallRail, Facebook, Twitter... we could go on. With the Metric Widgets, you can do everything you can with the Insight Graph, just widget by widget. That is, as opposed to creating custom visuals with cross dataset ability on one graph, you can do the same via series of comparative metrics. So you've achieved email marketing success, but how do you go about reporting it, whether internally or externally? Well, you have a few options available to you. The data you've tracked, for any of the three email marketing platforms integrated into Rank Ranger, can be sent out monthly as part of a white label PDF report or included within our Client Dashboard, an online white label reporting option. Lastly, and if you want to report with style, you could show your email marketing metrics within the 100% white label Marketing Dashboard. With full access to the dashboard's HTML and CSS, this multi-page dashboard can be designed to look and feel like any site you want. To top it all off, you can showcase your email marketing success alongside custom content such as videos, surveys, and forms that can be embedded into the dashboard in an effort to tell a truly unique and comprehensive success story. Access your client's AWeber, MailChimp, and Constant Contact campaigns. If you're tracking email campaigns for multiple clients, you're in luck. Now you can track email campaigns for all of your clients without having to jump from platform to platform. Throw your email marketing data across the various platforms into one of our white label options and you're ready to showcase email campaign success to your clients in style. It's like some sort of email marketing data bonanza. If you're working in-house and using but one of the above platforms, you're still in luck! Whether it be via custom charting inside the Insight Graph or Metric Widgets, or by showcasing email campaign success alongside your rank, social media, or paid search prowess inside of tremendous white label reporting, using Rank Ranger opens up your email marketing to deep and particularly broad analysis. It's pure email marketing mania!